This week we looked at the Legal Profession. This is the last topic in Module 2. We looked at the education, training, supervision, role and discipline of solicitors, barristers and legal executives. 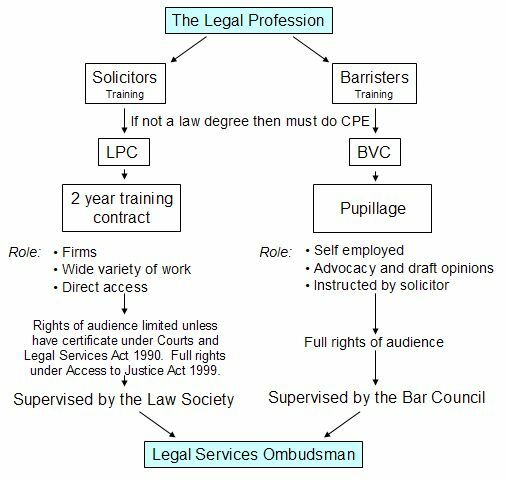 The diagram below sums up the training and role of solicitors and barristers. To become a Fellow of the Institutes for Legal Executives, you need to be over 25, have passed all the ILEX exams and worked in a solicitor’s office for at least 5 years. FILEXs tend to specialise in one area of law and deal with the most straightforward of cases. They have limited rights of audience. We also discussed fusion. There are arguments for and against fusion of the two main branches of the legal profession to create a “super lawyer”. The debate has slowed down over the last few years due to the introduction of the Access to Justice Act 1999. Many commentators have been critical of the self regulation of the legal profession. This led to the Clementi Report in 2004. This has led to both legal professions changing their complaints procedures and regulations. There are now lay members involved in all complaints panels. It is possible to sue a solicitor for breach of contract as there is a contract between solicitor and client. However, there is no such contract between a client and barrister. It is possible to sue a solicitor or a barrister for negligence in and out of court. Homework – please hand in your essay on the legal profession on the first lesson back after the Easter Hols! Answer one of the following questions. Answer both parts of the question. Your answers need to be handed in Tuesday 7th November 2006. Today we looked at an essay question previously answered on comparing and contrasting the roles of the Commission and the Council of Ministers. We looked at a “model answer” and redrafted our essays taking into account the model answer and our individual targets. Please complete this re-draft for Tuesday 17th October 2006. The redraft of the delegated legislation essay is due on 19th October 2006. This lesson saw three groups deliver their lessons on The Domestic Legislative Process. Group 1’s presentation was on “Introducing an Act of Parliament”. We saw that the pressure for new laws comes from a variety of sources. The main ones are: Government policy; EU Law; Law Commission Reports; reports by other commissions or committees; and pressure groups. We also looked at different types of bill (an act before it is passed is called a bill). Government Bill – introduced by a Government minister. Usually becomes law. Public Bill – a bill that concerns matters relating to the general public. Private Bill – a bill that relates to individuals or a private body like a university. Hybrid Bill – a mix of a public and private bill. Consolidation bill – brings together provisions of various acts in one place. We also discovered the House of Lords power is limited by the Parliament Acts 1911 and 1949. These allow an act to become law even if the House of Lords reject it. It is rarely used. An act either comes into force at midnight on the day it receives Royal Assent or more usually after a commencement order. Sometimes an act will never come into force. Group 3’s presentation was on “Criticisms and Problems with Sovereignty”. We saw through an example that the language used in acts of Parliament is complex and not easily understood not just by lay people but lawyers too! The Renton Committee in 1975 produced a report on the problems with language used in legislation. It made a number of recommendations but only a few of these were implemented. The Hansard Society Commission 1992 also produced a report which underlined the principles for domestic law making. Parliament law is sovereign over every other type of law. However, this has been restricted in recent years. The major restrictions on sovereignty are the EU law dimension and the Human Rights Act 1998. Essay question: “Discuss the advantages and disadvantages of deligated legislation”. Answers to this question are due Tuesday 10th October, 2006.